It’s gives me great pleasure to say that over the last decade or so there seem to be more and more young bands playing music that is firmly rooted in the old time string band era of eight or more decades ago. It remained popular until at least the late 1930s and has had several resurgent spells since, but currently seems to be achieving a decent level of cult status in Britain. In the case of this terrific four piece band it is almost as if the last seven decades never happened, at least, musically. Their music is sometimes described as bluegrass, country and Americana as well as string band but I must confess that on each of the many listens to this stunning album all I can hear is an incredibly authentic sounding version of the latter. ‘Authentic’ is an often over used word, with me being one of the guilty for using it to describe some of the bands that work within this generic template, but a true definition of the word is ‘of undisputed origin or authorship.’ As far as I’m concerned the music the Old Tire Swingers play on this their debut album is most definitely covered by this definition. Their music is rooted in the string band heyday and as to authorship; there are eleven originals, written by band leader, lead vocalist and banjo player, Paul Chesterton along with two traditional songs. There is always a danger with this old time music that there are going to be accusations of merely being copyists but that becomes redundant when listening to a band such as this that plays with so much fire, passion and feeling. The band hails from Fresno, California and was put together by the already mentioned Paul Chesterton and includes Nick Kennedy on guitar, Frick Dau on upright bass with Nate Felon playing mandolin. Paul Chesterton’s edgy sounding vocals are perfectly suited to the slightly ramshackle element inherent in ‘old time’ string band music as is the excellent playing and instrumentation. Fiddle often leads things off and is frequently as high in the mix as banjo and mandolin, with acoustic guitar often just filling in the sound. On several songs there is the lovely sound of a dobro and everything blends together well to give an always unpredictable mix of instrumentation and tempos. They play an ebullient form of string band music with humour never far away on most of the songs, leaving the lasting impression that they are having a really good time playing together. They can also do sad songs as in the gorgeous 1838, with its fiddle lead, ably assisted by banjo, set in a time and place that calls to mind a feeling invoked by listening to Stephen Foster songs. Most of the songs on this excellent album are upbeat and include some really good harmonies as on the mid tempo What You Give, a banjo, mandolin and guitar driven story about getting out of life what you put into it. Police is a speedier, tongue in cheek hoedown, followed by More Good Than Bad, a slower song that pleads with his love that despite his faults he is ‘ more good than bad,’ and includes guitar and gorgeous dobro, as well as the trademark banjo. It’s always difficult to judge the strength of a band on just one album but that’s all we have in this case and if they continue in this vein there will be many more excellent albums in a long career. I can well imagine that their natural habitat is playing live but they are no slouches in the studio either! 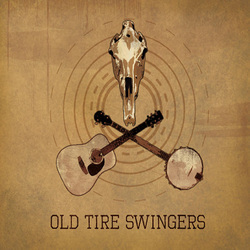 There is enough space in this genre for a band to bring in a few variations and a little originality to freshen things up and the Old Tire Swingers certainly achieve that. Footnote: As part of their British tour the band are playing a gig at the Snowdrop, Lewes on Wednesday 25th January 2012.